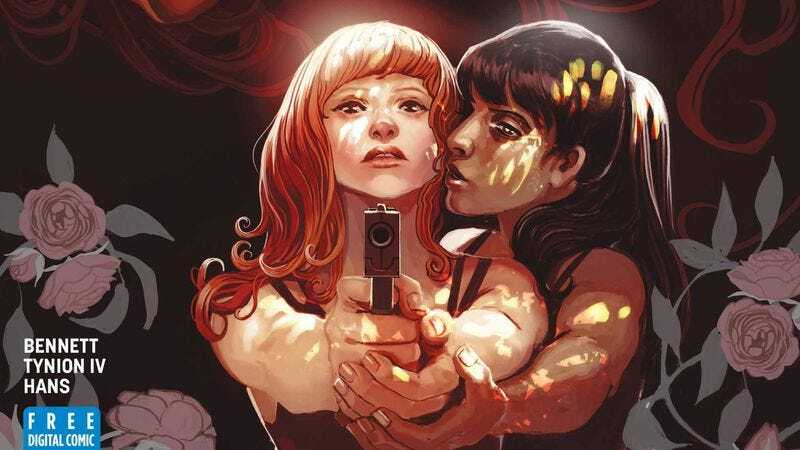 Batwoman #5 reunites Bennett with her Angela: Asgard’s Assassin collaborator, Stephanie Hans, whose digitally painted artwork gives this exclusive preview a very different feel compared to Epting and Cox’s visuals. Hans’ art is softer and more sensual, which fits well for a story about the start of Kate and Safiya’s romance. There’s a slightly foggy quality that reinforces this as a tale from the past, and the first shot of Safiya’s home manages to be both idyllic and ominous at the same time. There’s a darkness in the first two pages that dissipates as Kate and Safiya begin to form a personal connection, ending with a panel of Safiya against a bright blue sky as she asks Kate if she wants to be her prisoner. We don’t see the answer, but the visuals indicate that Kate is going to say yes.